CV9030 infantry fighting vehicle (IFV) in mud exercises. The CV9040 infantry fighting vehicle (IFV) travelling at speed. Rear view of the CV9025 infantry fighting vehicle (IFV). Close up of the CV90105 anti-tank vehicle (TML). CV90 forward observation vehicle (FOV). CV90 forward command vehicle (FCV) on forest operations. Troop operating the CV90 armoured recovery vehicle (ARV). The CV90120-T tank has been developed to provide a lighter, highly mobile main battle tank with a high pressure smoothbore 120mm gun, battlefield management system and extensive defensive aids suite. Combat Vehicle 90 (CV90) represents a family of armoured combat vehicles developed by BAE Systems Land Systems Hägglunds (formerly Alvis Hägglunds) of Örnsköldsvik and Saab Bofors Dynamics of Karlskoga, Sweden. It is also called Stridsfordon 90 (Strf 90). 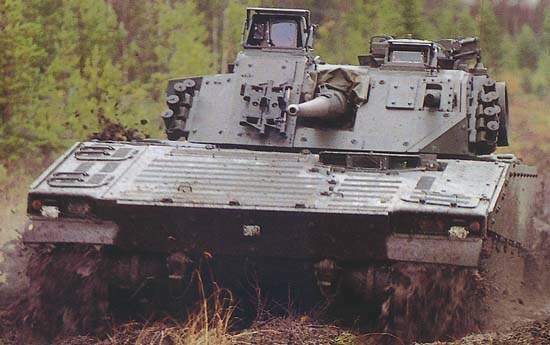 Originally, the chassis of CV90 was built by Land Systems Hägglunds, while Saab Bofors supplied the turret. 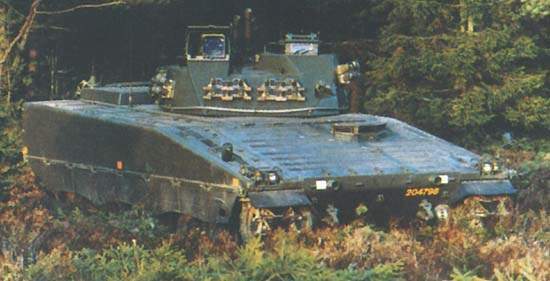 Currently, BAE Systems Hägglunds produces the entire vehicle. The development of the CV90 began in 1984 in response to the requirements outlined by the Swedish Army for a family of armoured combat vehicles with high tactical and strategic mobility, air defence and anti-tank capability, high survivability and protection. Production began in 1993 and more than 1,200 vehicles have been ordered. The 1,000th vehicle was delivered in January 2009. The CV90 is in service with the armies of Sweden (509), Norway (103), Switzerland (186), Finland (102), the Netherlands (192) and Denmark (45). CV90 vehicles have been deployed in Afghanistan by the Norwegian Army since November 2007 as part of the International Security Assistance Force (ISAF). A number of Swedish vehicles were deployed to Afghanistan in mid-2009. In July 2010, BAE Systems unveiled a new variant of CV90, called Armadillo. The all-welded steel hull can be upgraded with add-on armour, which protects against 30mm APFSDS (armour-piercing fin-stabilised discarding sabot) rounds. The vehicle has a low radar, acoustic and infrared signature. A fire detection and extinguishing system is fitted and full nuclear, biological and chemical (NBC) protection is provided. The CV90 infantry fighting vehicle is compatible with a range of armaments, sights and fire control systems to suit the mission requirement. All versions carry a crew of three: commander, driver and gunner, together with up to eight soldiers. Versions of the CV90 IFV include the CV9040 with 40mm gun and the export variant, the CV9030 with 30mm gun. 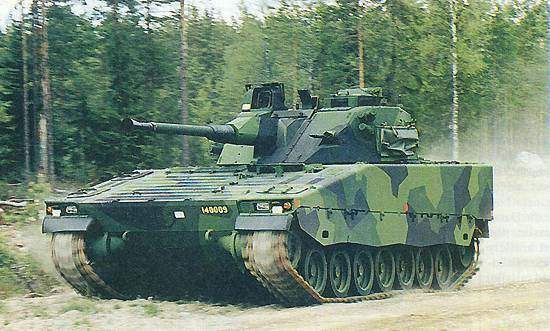 The CV9040 has been in service with the Swedish Army since 1993 with nearly 500 systems delivered and is armed with a 40mm Bofors L/70 cannon. Final deliveries were completed in September 2002. The sighting systems of a number of Swedish CV9040 vehicles have been upgraded with an LIRC thermal imaging system from FLIR Systems of Portland, Oregon. LIRC is based on QWIP (quantum well infrared photodetector) technology. In March 2005, Saab Systems was selected to develop a battlefield management system for Swedish Army CV9040 vehicles. Deliveries began in 2008. 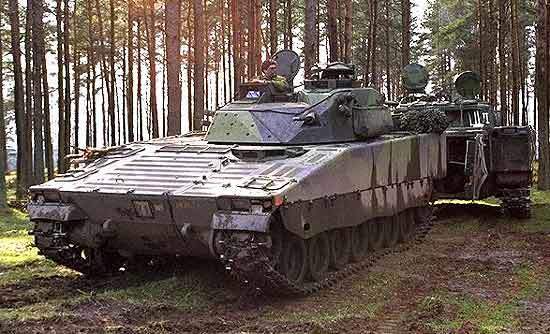 The CV9030 has been operational with the Norwegian Army since 1995 (103 vehicles). It is armed with a 30mm ATK Ammunition Systems (formerly Boeing Ordnance) Bushmaster II cannon. In June 2012, the Norwegian Defence Logistics Organisation placed a $750m contract with BAE Systems to upgrade existing CV90 vehicles and also deliver new CV90 vehicles for the Norwegian Army. Under the contract, BAE will upgrade the existing fleet of 103 vehicles. It will also deliver 144 new CV90 vehicles, including 74 IFVs, 21 reconnaissance, 15 forward command, 16 engineering, 16 multirole variants and two vehicles for driver training. The CV9030 mkII, called the Grenadier Tank 2000, is in service with the Swiss Army. 186 vehicles were delivered between September 2002 and December 2005. The 9030 mkII is fitted with an ATK 30mm/40mm Bushmaster II mk44 cannon, Saab Systems UTAAS anti-aircraft sight and the digital Hagglunds vehicle control system (HVCS). HVCS includes a video network system with displays at each crew station and vehicle built-in test system. It can be extended with a battlefield management system and the Hagglunds defensive aids suite (HDAS). Finland operates 57 CV9030 mkII vehicles and has ordered 42 additional vehicles, out of a total requirement of 102. 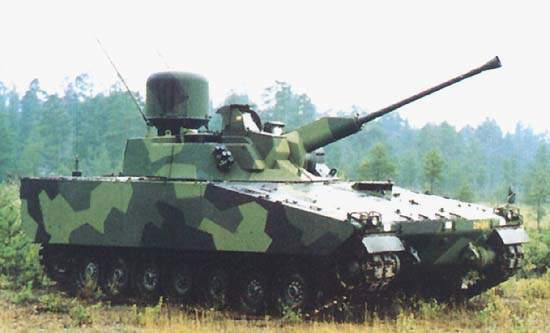 Patria Hagglunds (a joint venture company) is building the vehicle turrets and the first was delivered in April 2002. A second contract for 45 vehicles was placed in June 2004. In September 2003, Land Systems Hagglunds received a contract from the Norwegian Army to upgrade 17 CV9030N vehicles to the CV9030S configuration. The upgraded vehicles, called CV9030NF1, have an additional mine protection kit, new air-cooling system and rear view camera. 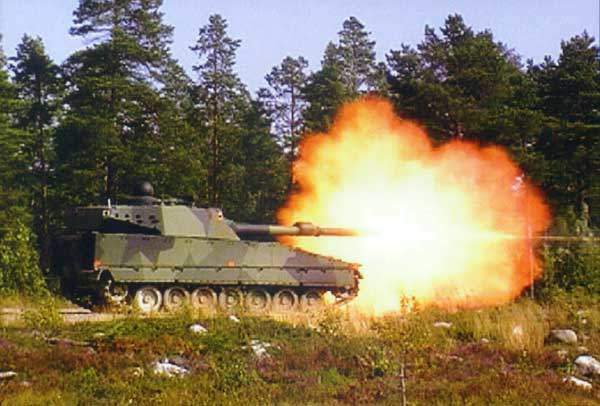 Patria Hagglunds has been awarded a contract to integrate the AMOS (advanced mortar system) on a Swedish Army CV90 infantry fighting vehicle. The AMOS twin 120mm mortar system has a direct fire capability and a digital, computerised fire control system, which can fire a variety of mortar bombs including the Strix ‘smart’ mortar, developed by Saab Bofors Dynamics. In December 2002, AMOS was shortlisted as a candidate for the US future combat system programme. In July 2006, the Swedish Army ordered two AMOS systems for delivery in 2011. In December 2004, the Netherlands signed a contract for 184 CV9035 mkIII vehicles and eight CV9035 instruction vehicles. The vehicle entered service with the Dutch Army in December 2008. Van Halteren Metaal of the Netherlands is responsible for turret assembly and integration. Deliveries concluded by 2011. The CV9035 mkIII features a Bushmaster III 35/50 cannon, Saab UTAAS fire control system with ammunition programmer, a rotating cupola which provides hunter-killer capabilities and commander and gunner stabilised day / night sights, with third-generation thermal cameras. The mkIII has a new armour package, supplied by RUAG Land Systems with increased protection against top-attack weapons and mines, and fitted with Hägglunds’ defensive aids suite (DAS) with laser warner and smoke grenades. In June 2005, Thales Optronics was awarded the contract for the vehicle’s MT-DNGS commander’s sight, which includes the Claire mid-wave (3 to 5 micron) thermal camera, and the UTAAS with the long-wave (8 to 12 micron) Catherine XP thermal camera. In December 2005, Denmark ordered 45 CV9035 mkIII vehicles. The first was delivered in October 2007 and deliveries concluded in September 2009. They were deployed in Afghanistan in March 2010. The Danish Army plans to order another 45 CV9035s. The CV90120-T is a light tank which has a Hägglunds turret mounted on the latest CV90 chassis. RUAG Land Systems of Switzerland has developed the fully stabilised 120mm high-pressure smoothbore CTG 120/L50 gun, which has a rate of fire of up to 14 rounds a minute. Saab Systems of Sweden has developed the fire control system, UTAAS and the panoramic low-signature commander’s sight, which gives the tank hunter / killer capabilities. The tank’s battlefield management system is based on fully integrated, scalable and open electronic architecture and a video network with displays at each crew station. The tank’s defensive aids suite (DAS) includes laser, radar and missile approach warners, as well as an MSA (multispectral aerosols) active countermeasure system with top attack radar that can identify smart indirect munitions. Survivability is further enhanced by the stealth turret design and radar absorbing track skirts. 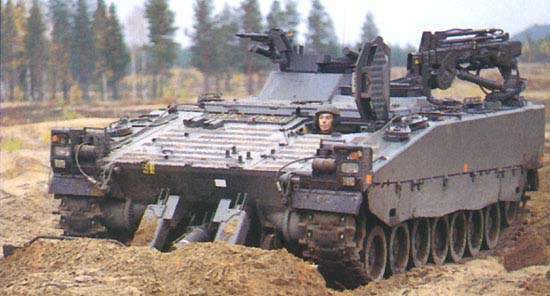 The CV9040 anti-aircraft vehicle has been in service with the Swedish Army (42 vehicles) since 1995. It is fitted with a Thales TRS 2620 reconnaissance radar and automatic threat evaluation. The vehicle is capable of engaging aerial targets, including helicopters, at ranges up to 4,000m. It is fitted with Saab Systems UTAAS anti-aircraft gun sight for the Bofors 40mm L/70 cannon, which includes a thermal imager, laser rangefinder and fire control computer. The CV90 forward observation vehicle is equipped with an enhanced sighting system, incorporating a laser rangefinder for target detection and acquisition. The vehicle has improved communication and navigation systems. The turret has a 7.62mm machine gun. The CV90 forward command vehicle is a mobile combat C3 (command, control and communications) vehicle equipped with advanced communication and command equipment. The turret is fitted with a 7.62mm general-purpose machine gun. The command vehicle provides accommodation for a crew of three, along with additional workstations for mission crew. The CV90 armoured recovery vehicle is operated by a crew of four and is capable of applying a 72t line-pull in any direction. The cupola is armed with a 7.62mm machine gun. Recovery operations are carried out using two Rotzler hydraulic winches and a hydraulically operated crane. A dozer blade is fitted on the front of the vehicle. The new variant, the CV90 Armadillo, offers additional protection and flexibility without a turret. The vehicle weighs 27t and has a payload capacity of 8t for armour and additional equipment. It can provide horizontal ballistic protection against mines of about 10kg. The Armadillo variant also has an external fire suppression system and Saab LEDS-150 active protection system. The future developments of the CV90 will include bridgelayer and other variants with enhanced protection. eSim Games specialises in virtual simulations of the fire control systems of armoured fighting vehicles and remote weapon stations in a combined arms tactical context. BEI Precision Systems & Space Company designs and manufactures both militarised and space versions of optical encoders, scanners, accelerometers and subsystems for use in armoured vehicles, spacecraft, tracking radar and avionics. BEI Precision Systems and Space Company is now offering an Absolute Intuitive Modular Encoder (AIME-II) configuration in the nanoSeries® Encoder family. BEI has been producing encoders for armored vehicles since 1980. Kidde was founded in 1917 and has long been associated with specialty fire safety products for aircraft and vehicles. DST Defence Service Tracks is a market leader in the maintenance and servicing of military vehicle fleets worldwide. Iveco, a Fiat Industrial company, designs, manufactures, and markets a broad range of light, medium and heavy commercial vehicles, off-road trucks, city and intercity buses and coaches as well as special vehicles for applications such as fire fighting, off-road missions, defence and civil protection.